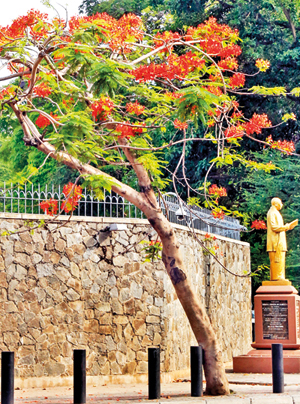 During the Sinhala and Tamil New Year in April and continuing to May, cities such as Colombo witness a great flowering of trees, with roads literally carpeted with flowers. When I grew up in Colombo, I took it for granted that these were local trees. Why else would they be in Colombo? However, as I grew more interested in natural history I realised that almost all of the trees with a spectacular flowering in Sri Lankan cities come from overseas. In fact, this is especially true of Asian cities with many of the most showy flowering trees having come at times as far afield as the American tropics (the neotropics). The ornamental trees found in many Asian cities date to the European colonial period. Just as the British introduced foreign trees to their colonial possessions so did the other European powers to their overseas territories. All over Asia we see this influence. Here are some of the beautiful trees that grace Colombo, providing shade, carbon sequestration and colour. A popular decorative tree planted widely in the tropics, this is a tall tree with a greyish bark. In mature trees the bark is cleft into deep furrows. Small buttress roots develop. The showy trumpet-shaped flowers have five petalled lobes. The petals fall off easily leaving behind a long style. The leaves have two to five lance-shaped leaflets each with a distinct stalk. In a leaf with say five lobes, the two leaflets on the sides will be stalkless and the three central leaflets will have long stalks. The seed pods split to release seeds with thin, papery wings. The tree is native to Central and Northern South America. The scientific name Tabeubia is derived from a local Brazilian name and rosea refers to the pink flowers. A tall tree with upward sloping main branches with the smaller branches inclined to droop, the foliage has a feathery look overall. Numerous yellow flowers are borne in panicles. There are five roundish petals. The inflorescences are rather showy but are often too high up above the flow of traffic in cities like Colombo for people to see them.The leaf is a compound leaf with lateral branches arranged on opposite pairs (i.e. pinnate) to a midrib and these in turn having opposite pairs of leaflets or more technically pinnae. The leaf is what is termed a bipinnate (or twice innate) leaf. There is no terminal leaflet. The fruit is reddish-brown pods which is flat and shows the outline of the one to four seeds they contain. The seeds are winged. It is widely planted in towns and roadsides as a shade tree and as an ornamental for its flowers. The scientific name Peltophorum comes from the Greek ‘peltophoros’ meaning shield-bearer. Pterocarpum means winged seed. A large tree which can be sprawling and many branched if it is allowed room to grow. The trunk and branches are pale. 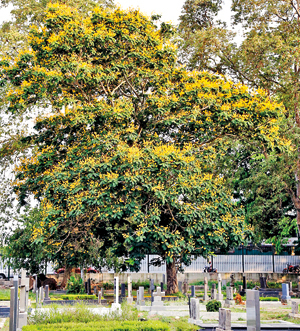 A common roadside tree in towns and villages, it is instantly recognisable when it is in bloom.The large red or orange flowers are in clusters. There are 10 stamens which extend beyond the petals. The upper petal has a white or yellow stripe.The leaf midrib has opposite lateral branches (pinnate) which in turn have opposite pairs of leaflets (bi-pinnate or twice pinnate). The leaflets are small and the leaves overall give the tree a feathery appearance. The pod is around 30 cm long, flat, with numerous seeds. It is believed to have originated in Madagascar although it is no longer found anywhere in a wild state. It is widely planted in the moist tropical belt around the world as an ornamental. The generic name Delonix means evidently or obviously clawed from the Greek ‘delos’ meaning evident and ‘onux’ for claw. Regia is Latin for royal. It can grow into a large tree, although the trees in Colombo for example are never very big. But that does not prevent them from flowering. 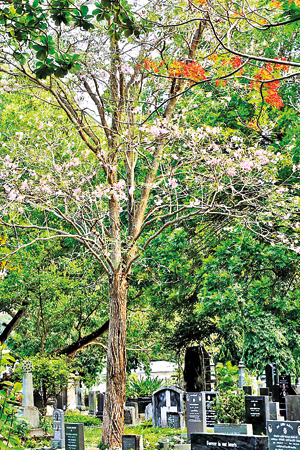 Guildford Crescent in Colombo is a good place to find this tree, also the car park of the Beddegana Wetland Park. In flower it is a beautiful tree which is planted widely as an ornamental. 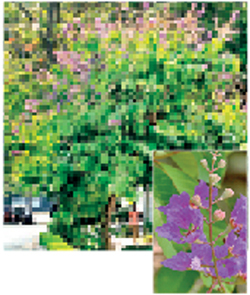 In North-eastern India it is a very important timber tree.The purple or lilac flowers are borne on terminal panicles. The flowers have six purple petals and are wrinkled. Each flower has many stamens. The purple stamens have yellow anthers.The leaves are arranged in pairs opposite or nearly opposite each other. The margins are smooth, described as ‘entire’ in botanical terms. The leaves have prominent veins. The fruits are brown and round. The leathery skin splits open from three to six valves to release the winged seeds. The scientific genus honours M. Lagerstroem (1691-1759), a Swedish patron of science. Speciosa is Latin for beautiful, a reference to the flowers. A common roadside tree and a popular choice in parks and public spaces, this is a medium-sized tree with a light brown trunk. It begins to branch very close to the ground and can have the appearance of a tall shrub. In flower it is one of the most attractive flowering trees to be seen in Asia. The bark is greenish-grey and smooth when young and brown and rough when old. The yellow flowers are in long pendulous racemes and are very showy. The flowering often peaks to coincide with leaf fall which makes the flowers even more prominent. The flowers have five petals with three stamens with long, upward curving filaments. The leaves have oppositely arranged pair of leaflets along the midrib of the leaf. The leaves can be around 30 cm long with around eight pairs of leaflets. The tree has long, cylindrical pods up to a metre long. The pods can be brown or black, with between 40-100 seeds within a pulp. Sloth Bears, jackals and monkeys eat the pods and play a role in dispersal. The derivation of the Latin fistula has two explanations. One relates to the bark of the tree being exported to Europe. It was rolled up into tubes and this may have given rise to ‘fistula’ a Latin reference to pipe. An alternative explanation is that fistula refers to the pods. 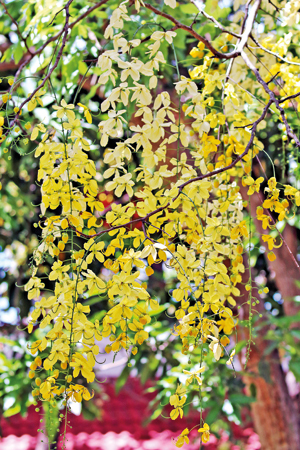 Cassia comes from the Greek name ‘Kassia’. Many majestic examples of this large tree can be encountered on road-sides. In Colombo, Bauddhaloka Mawatha ( Buller’s Road) has some especially fine examples lining the roadside creating a shaded canopy to the road. The bark is a dark brown. During wet weather and at night, the leaflets fold down giving a wilted appearance.There is some seasonal leaf fall but in Sri Lanka it is not so pronounced as to see the trees devoid of leaves.The flowers are in solitary circular heads. The flower stalk (peduncle) is long; around 12 cm. The petals are yellowish. Packed into the centre are 20 red stamens which extend well beyond the petals. The leaves are twice pinnate and have a feathery appearance. The pod lacks a stalk and is straight and smooth and around 20 cm long. The tree is a native of Brazil which has been widely introduced into Tropical Asia in humid areas where it is a fast growing tree. Saman refers to a local American name. 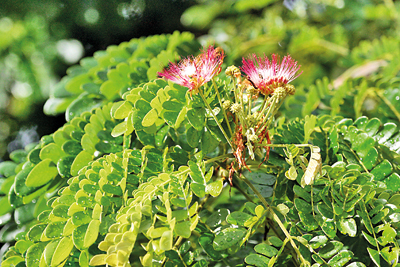 The English name Rain Tree comes from a discharge of water droplets from the tree. This happens when the tree is infested by cicadas who discharge small droplets.